This Ford F150 Dual Exhaust works with 2005-2008 Ford F-150 4x2 and 4x4 vehicles with 4.6L and 5.4L engine SuperCabs with a 6.5' box and SuperCrew Cabs with a 5.5' box. The dual exhaust pipes on this system exit at the rear of the truck. A side exhaust exit version of this system is also available under part #R12000005. ROUSH®:'s Ford F150 Dual Exhaust enhances the power, fuel efficiency, and sound of your vehicle. This dual exhaust for the Ford F150 is made of 409 aluminized steel, providing for resistance to corrosion. The mandrel bending process used for the tubes of this system maintains a consistent inside diameter through the bended area. This method allows for a significant increase in flow over stock/serrated-bent pipes. Due to this increased efficiency, both latent power and fuel efficiency are realized. The exhaust system generates a loud, throaty-sound. 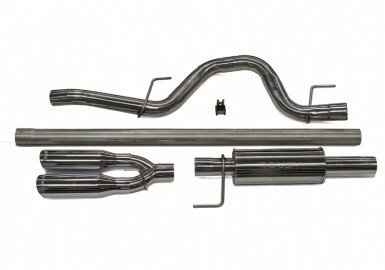 This is ROUSH's "Off-Road" exhaust system for 2005-2008 F-150s, meaning that the sound level of this system are above the levels legally required limits for production vehicles. For a system that is below the legal sound limit, a "Legal" muffler package (part #401591) is also available.